A new poster for The Hunger Games: Catching Fire, out November 22, recently appeared on The Hunger Games‘ Instagram account. It features Katniss Everdeen (Jennifer Lawrence) standing atop a mountain with her bow and arrow, as the clouds form the wings of the mockingjay, a symbol of rebellion in the series. 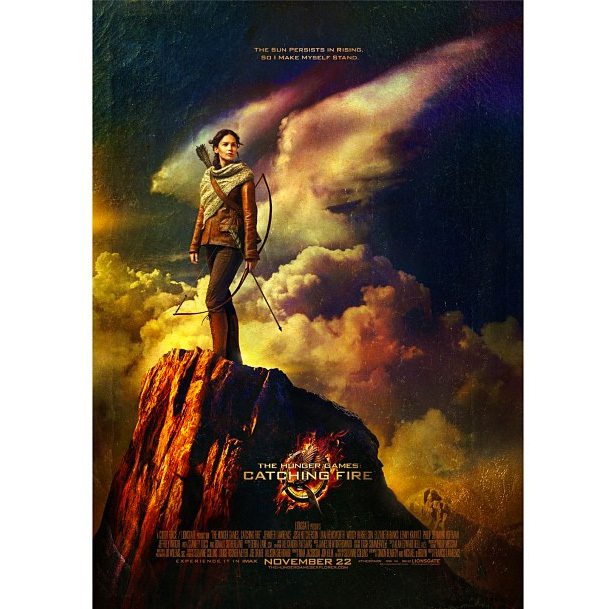 The poster’s tagline reads: “The sun persists in rising, so I make myself stand,” a quote from Catching Fire clearly referring to Katniss’s reluctant acceptance of the rebellion in the Capitol of Panem (a dystopian North America) that she inadvertently stirred during her stint as a tribute in the Hunger Games during the first film. This entry was posted in News and tagged 2013, hunger games, jennifer lawrence, poster, preview, sequel. Bookmark the permalink.